ONE SIMPLE SOLUTION FOR MANY APPLICATIONS. Whether it’s commercial or residential domestic hot water, the Eternal is the right solution. Its triple pass design provides endless hot water with up to 98% efficiency, and comes with a 15 year residential / 5 year commercial no leak warranty. The Eternal GU195S can support up to 4 applications simultaneously. You can run the dishwasher, shower, and do the laundry at the same time. In commercial applications, the GU195S can be combined with additional storage to support unpredictable surges in demand for hot water. 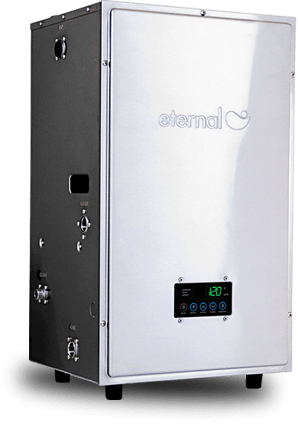 Eternal is compatible with most recirculation systems, whether it’s a dedicated return line or under-the-sink retrofit pump. The built-in reserve tank within the heat exchanger makes instant hot water possible. day or night - get it done right!